Owner Nancy Jaksich receives appreciation of students, teachers at Mt. Hood Community College. Suburban Auto Group owner Nancy Jaksich recently made a $65,000 donation to Mt. Hood Community College's Ford Automotive Student Service Educational Training (ASSET) Program. This donation brought the total of the Sandy-based company's contributions to the school up to $150,000. Jaksich has been an active member of the MHCC Foundation Board for 11 years, and was named the school's 2017 Patron Saint in May. The MHCC Foundation Finance Committee also named its 2017 Hero for Education Scholarship to honor Jaksich's dedication to the school. The Hero for Education Scholarship was implemented to honor a new local community member, college employee or board member every year. Student Sandra "Meg" Nau received the award this year. Jaksich was surprised with a collective 'thank you' from the students and instructors of the ASSET program at the MHCC Board meeting on Wednesday, Nov. 29. They gifted her a photo of the entire class, with signatures on the back. "To look at those young candidates and students and know what their future is going to be — that's exciting," Jaksich told The Post. The Jaksich family has been a longtime advocate for education and supporter of MHCC. 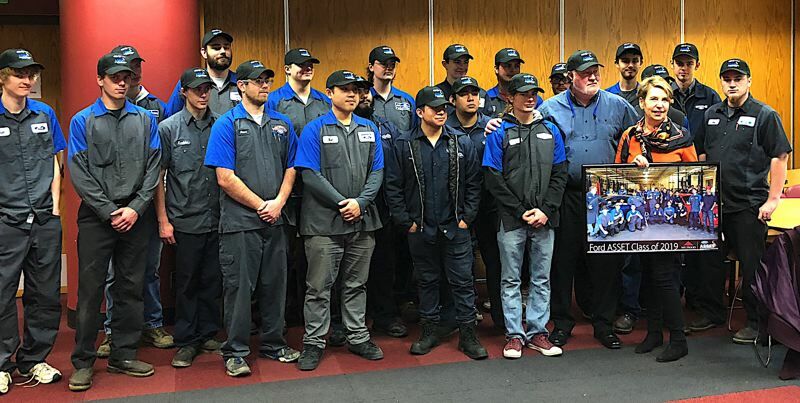 Nine of the technicians at the Suburban Auto group are graduates of the MHCC auto program, and the dealership also employs two of the students now working through the program. "It's our future, and these are extremely valuable positions for us," she added. "And they are great futures for those students. Mt. Hood Community College is this treasure, diamond we have here in our East (Multnomah) County." With this latest donation, the college's automotive department was able to purchase new technology to further its educational opportunities for students. ASSET is just one of the school's numerous automotive programs. MHCC offers two other two-year degree programs — the Chrysler Mopar College Automotive Program (MCAP) and the Individualized Mechanical Program of Repair Technicians (IMPORT) — and also a certification in Automotive Technology — Maintenance and Light Repair (MLR), which is a nine-month process.